sometimes an email falls into my inbox that makes me feel like the luckiest girl in the world. this weekend, that was an email from french designer emma cassi. not only is emma incredibly talented and a phenomenal artist- she happens to live in what has now become my new dream home. based in london, emma works as both as jewelry designer and interior stylist; her skills as an interior stylist are wonderfully apparent from even a brief viewing of her home photos, but when i dove into them a bit more deeply i was blown away by the subtle details around the house: artfully composed vignettes, small groupings of objects and toys and a wonderful ability to add color in just the right place. normally we share two sneak peeks on monday but i had a hard time editing emma’s photos past a few dozen so i decided to focus entirely on her home today. i’m going to go unpack and settle into my temporary los angeles home at the elan hotel and get ready for tomorrow’s meetup. until then, i hope you’ll enjoy emma’s home as much as i did (how cute is her son anton in that last photo?). 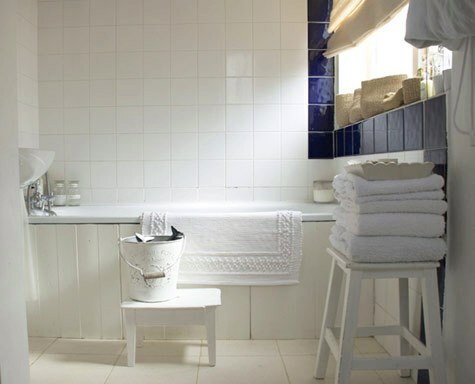 as always, you can click here for full sized and extra images of emma’s beautiful home. thank you again to emma for sharing her incredible home with us! I live in south west London, near Richmond park, on a lovely street with antique shops (Dining room and Tobias & Angel). We moved to this flat about 3 years ago- It is all white so it is great to use as studio for photos (my husband is a photographer). My little boy’s toys are everywhere and the decoration is changing all the time… Most of the furniture is from France from family or antique shops. 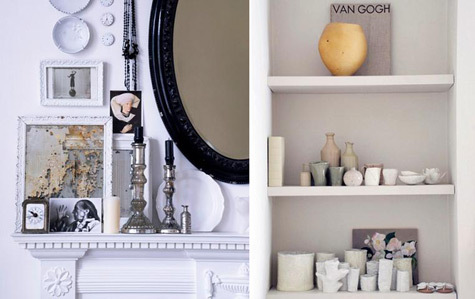 I also have a collection of Astier de Villatte, Tsé-Tsé and vintage pottery that I use for photo shoots. I love the fact that the living room is big and bright with 3 big windows- I have just hung a curtain in the room to create my office corner. My son Anton’s bedroom is a really fun space full of vintage books and toys, collections of animals and cars (new and old) and colorful pieces of furniture. We find all the vintage things while we are on holidays (like the Japanese paintings) or back at home in Dijon, Burgundy. One last thing about our home: I fell in love with the balcony and the living room right away: they’re bright and large so I can work at home while my son is at nursery school. Currently I’m selling my jewelery at Designer’s Guild and H.P France, Goldie in Tokyo and my online boutique right here. Truly beautiful. I was hoping Emma could tell us where she got the fabulous metal dish cubby? I know I’ve seen it somewhere, but I just can’t place it…Thanks. 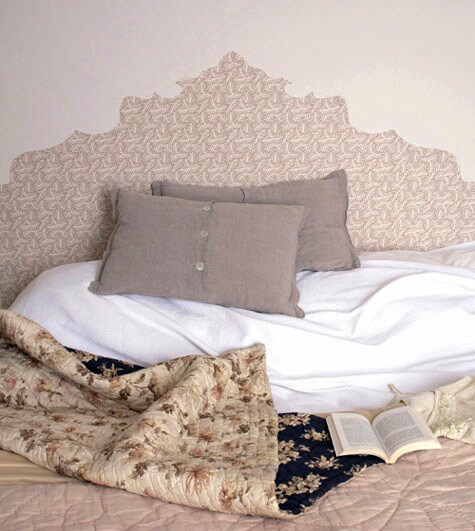 Love love love the headboard made out of paper -idea. Looks cute as hell! Wow and wow. This place looks absolutely heavenly. I adore the small batches of collections and use of white. So, so very lovely! I can’t even pick out one picture that I love the best. Each one is filled with beautiful treasures and arrangements. Oh, I’m drooling over here! 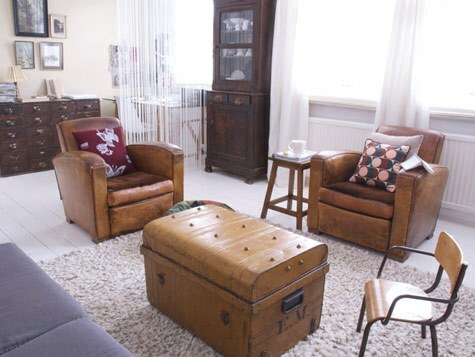 Where do those wonderful deco leather chairs in the living room come from? 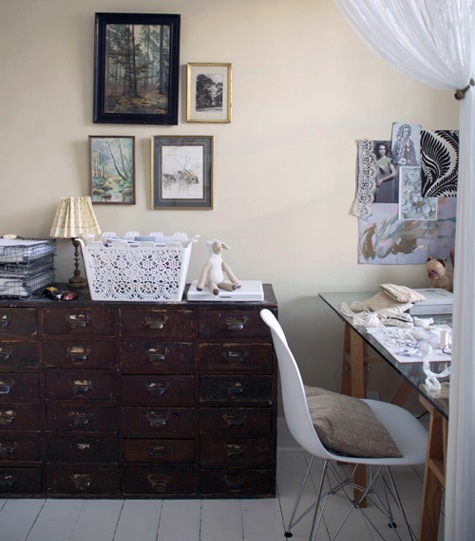 I’ve bookmarked her blog to provide inspiration for my new home that I’m moving into. I want to copy EVERYTHING. My goodness. How gorgeous. Hello Lover! I need to move into this house. I LOVE the little boys room (I have a little boy who would fit right in). I also adore the headboard. Everything I love under one roof, too beautiful. 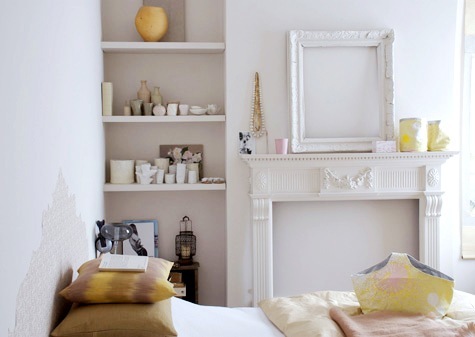 So calming and restful yet packed with inspiration, love it! Gorgeous! The white w/ bits of color is lovely. What I love most is how everything looks as if it tells a story. 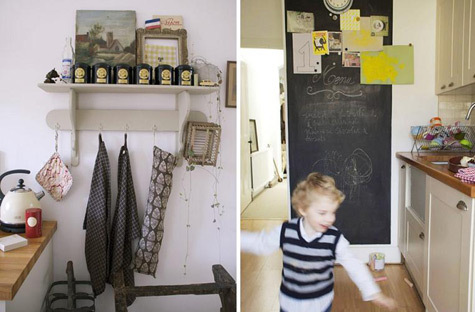 Would that be chalkboard & magnetic paint in the kitchen? I was just thinking about trying that out and this has just finalized the decision! Oh my, am almost lost for words… this is a beautiful home! beautiful, i love it! The chalkboard is my fav! Great use of pops of color! Lovely. Beautiful. Might Emma consider writing a city design guide of London for d*s? That would be REALLY lovely! I love those leather couches/settee’s. The metal dish is from the Conran shop but you can find the same here. The leather chairs, we bought them on e-bay! Amazing! if you are desperate looking for this furniture, probably you will find at salone del mobile in Milan, where there ‘s an spanish brand ( http://www.muebledeespana.com/milano ) who design this style! I usually have a hard time seeing painted over mantels but she did a truly amazing job :) I am also madly in love with the library catalog style shelving! 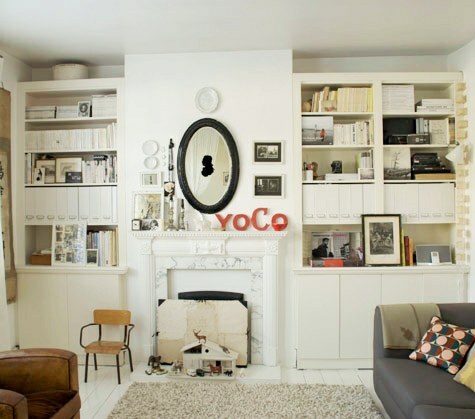 does anyone know the name of the type of drawers in the living room pic? I’ve been looking for old drawers like these but have no idea if they have a proper name which would aid my search! LOVE these rooms! I could stare at these pictures all day! ah, so fresh! I love it. any chance you could pass on a hint as to where you got your living room rug? Thank you for sharing! Emma Cassi’s blog has the best links to other great blogs and websites! I could get lost in these photos too! 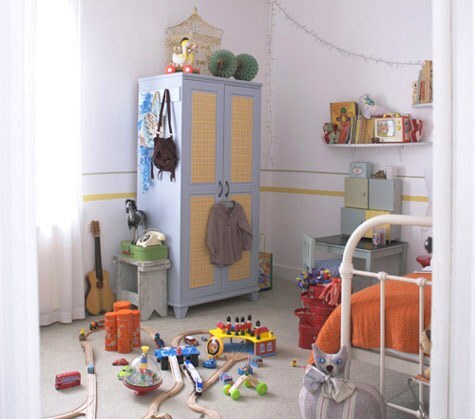 Anyone know where the cupboard in the little boy’s room is from? The rug is from Habitat, the cupboard in Anton’s bedroom is from Ikea. In the 4th-last photo (mantel detail) there’s an old mirror with the backing aged and come off in some areas. What’s this state or process called??? I’ve been looking for such a thing. Can anyone help? Would be much much appreciated! I feel peaceful just looking at the openness and light. i just stumbled upon this post…and i am dying to know where emma got the beautiful floral quilt that is on the bed (beige/dark blue)? I’m with Natalie. When this post first came out I forgot to ask where the beautiful black floral quilt is from. I’d love it if you could find out. In the first picure is that a fake fireplace ? I’ve had her bed as my inspiration for such a long time — I had no idea where I found the picture until you rehighlighted this in the wallpaper post. I love, love, love that black quilt. Any tips on where she got it, or how to find a duplicate?